Treize has been arrested for speaking out against the Romefeller Foundation, but he escapes with the help of loyal troops. Now, Romefeller has declared Treize an enemy along with the Gundams, and they launch Operation Nova to end both threats. Heero and Quatre return to Earth and find themselves the targets of Romefeller, and are forced into battle once more. As they both question the path they are on, Relena declares the Sanc Kingdom neutral. It is an open invitation for friend and foe. 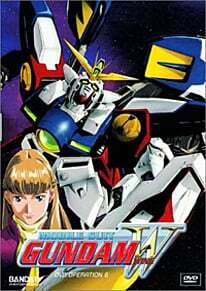 How it happened, I'll never quite know, but in some wacky way, Cartoon Network and Bandai teamed up and made the entire Gundam thing popular on TV here in the U.S [In Canada too –Ed]. Mobile Suit Gundam Wing was the series that started it all. Sure, Bandai released a few of the original movies and OVA series way back when, under the name of “Anime Village,” but no one really ever bought those. And now, here it is, Mobile Suit Gundam Wing Volume 6, containing episodes 26-30 of the total. Just now beginning the second half of the series. The DVD aspects are top-notch. Gundam Wing discs have always featured excellent audio and video quality with nothing changing here. Menus are just as stellar as they've always been. Designed the exact same way as the past five volumes, the computer screen-like interface is fast and easy to use. Extras include a couple of tiny character bios and a few Bandai trailers. If you don't particularly care for the entire “pretty-boy” and slight “wanna-be badass” qualities of the characters, it's hard to actually care for them. The majority of the Gundam pilot cast is made up of troubled and deranged nut-balls that certainly needed a lot more individual attention while growing up. Every one of them acts so odd and so extreme that it's nearly impossible to relate to them, even if you're nutty as well. Supposedly likeable characters are not very likeable at all. If you're looking for a series that features characters you'll either love or love to hate, Gundam Wing might be one you'll wish to avoid. For the true fans of this series, there's only one real downer with this disc. Only three of the five episodes within contain any real meat. Two of them are nothing more than recap episodes, with various characters from the show summarizing the series thus far. While the Gundam Wing fans coming off of some large hiatus may appreciate it, if you know what's going on, it's not a very exciting watch. The remaining three meaty episodes in this offering are quite decent, bringing about the second half and story-arc. Heero and Quatre are the stars here, as they make their way back to Earth while going through various discussions on whom and why they are fighting. Of course, there is the on-going political side of the series as well. Those who have enjoyed previous Gundam Wing episodes should have no problem here. As usual, the animation of Gundam Wing is very pleasing for the eye. The few battles that do take place look great. However, Gundam Wing is not an action series. It is much more about the politics and philosophies surrounding the war than the actual fighting itself. For those looking for a series that revolves more around mobile suit fights and the heat of battles, it may be wiser to look into Gundam 08th MS Team instead. If you've survived the series so far, there's no reason to stop now. While only three of the episodes are really worth anything, it's still a good watch and you definitely don't want to fall behind. Wingers, you should know what to do! And if any newcomers are present, check out the first disc but be careful as well. − Two episodes are nothing more than recaps.